MICHIGAN is a U.S. state which is located in the Great Lakes Region (Great Lakes Region). Michigan's name previously was mishigama (Ojibwe language) means "big water" or "large lake. 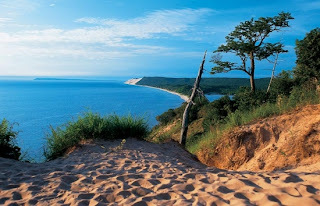 Let's take a walk to the northeast coast of Lake Michigan where there is Sleeping Bear Dunes National Lakeshore. In place of more than 28 730 hectares, there are 160 kilometers of roads are dotted with parks. 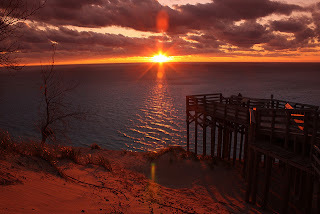 Sleeping Bear Dunes National Lakeshore is only about 40 miles from Traverse City, Michigan. For those of you who want to find lodging, one of the best options are the Lakeshore Resort is a cottage or a condo on the coast. More info, visit www.visittraversecity.com. If you want to look for other interesting places in Michigan, Pyramid Point or taken up to the Bay View. In these places you can see the beautiful lake view, while picnicking with your beloved family. Do not miss another picnic also places, such as the Pierce Stocking Scenic Drive. Here you also can take pictures with a camera tripod or just sit on a wooden bridge, looking at the natural beauty of a lake. As for you who want to play canoe and kayak are also provided in the package tour of the history of the Port Oneida Rural areas are located to the north of Glen Haven (the name of the village in Michigan). In this area there are 20 farms, two cemeteries, schools, and barns scattered (1,200 hectares). Still want to play in Michigan? At Pirate's Cove, Traverse City is also a place to play. Starting from the arena go-karts, putt-putt golf course, and some of the other games. This place just opened in late April to late October.